Nametags may not be sufficient for identification purposes as my upcoming 50th high school reunion approaches in the coming year. After glimpsing some photos of fellow classmates at a Facebook site designated for our class of 1962, I’ve decided that we may each need a slide show to help recognize those who once sat beside us in algebra class. How do I diplomatically and delicately put this? By all appearances, it seems that life has been very good to us, or in more blunt terms: we all look to have been extremely ‘well fed.’ At this stage, most of our faces could hardly fit in those little yearbook photo boxes. When I wrote a recent column about my expanding waistline, I had no idea that I’d be thinking now about packing the wide-angle lens for my reunion trip—and I don’t mean just for group shots. I am fully aware that most of us likely now have the appearance of my Aunt Bertha and Uncle Toby in their later years. However, lest we forget and underestimate the almighty power of denial, which has worked marvelously for me in many realms of my life, I may now find it necessary to call upon its spiritual healing powers as this reunion nears. Perhaps my classmates have dealt with life’s ravaging blows as I have, and adopted a friend’s advice to lower the bathroom lighting by 10 watts as each birthday rolls around. His wife claims it’s so dark in there now that he can barely see himself in the mirror to shave. My bathroom wattage is now at a bold 40 watts, and my pal’s theory is working beautifully for me, although my friends occasionally volunteer to wipe away the excess shaving cream from my chin in the mornings. After removing the fork which I had accidently jabbed into my thigh, I decided this represented only a minor setback, and I simply just needed to fill her in on a few details before those warm memories would surely come flooding back to her. However, after reminding her that I had worked with her at the local grocery market, sat beside her in three classes, and ‘stalked’ her as she walked home every afternoon for two years—she still couldn’t identify me. (Maybe this was a positive development given the stalking part.) I was now living out everyone’s worst nightmare of fears of invisibility in the high school experience. Nevertheless, she sent me her story and now we know each other’s history, but she still doesn’t have a clue who I am. 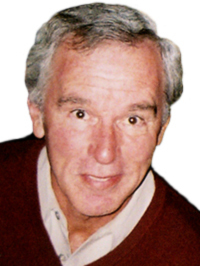 Bob Vickrey’s columns have appeared in the Houston Chronicle and Ft. Worth Star-Telegram. He is a member of the Board of Contributors for the Waco Tribune-Herald and a contributor to the Boryana Books website. He lives in Pacific Palisades, California.